An interactive web log analyzer for Apache and IIS servers. Unique features allow you an easy and quick segmentation by browsing into details and applying live filters. Create your CD labels with ease! 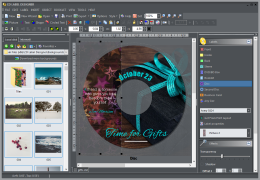 This Windows program will help you design and print CD labels (jewel case front, inside and back, DVD box, round disk, business card labels and booklets). At last, an easy-to-use but powerful PIM and To-Do Windows application - with a flexible interface that really supports you in managing your personal data. Custom-made professional looking and performing desktop software applications, tailored for your own use or for further distribution. Ensure your company web presence. We can build a website for you - either simple and static, by using some of Content Management Systems (CMS) or create a custom solution. We have decided that our Agenda At Once PIM software, previously priced at $39.95, will be completely free from now on. No cut down features, no Premium offers, no special upgrades – simply free. In addition, the latest update solves the problem with saving settings on 64-bit Vista+ computers and also adds a support for Windows 8. This entry was posted in Agenda At Once, General and tagged calendar, freeware, pim, software, to-do on March 4, 2013 by vradmilovic. This entry was posted in CD Label Designer, Web Log Storming on February 11, 2013 by vradmilovic. 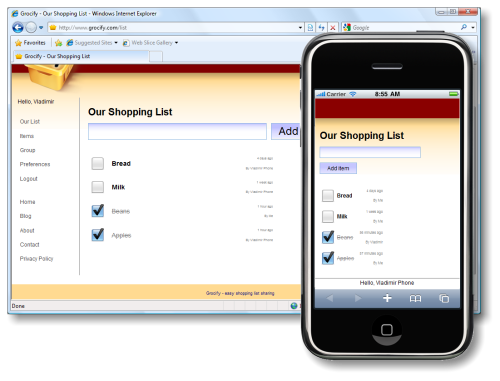 Some time ago we have developed basic shared shopping list web application. It was something like hobby project back then, but now we have decided to make it better by adding more advanced features. Grocify is a web application that allows you to share shopping list with your close family, roommates or whoever. After someone from your group adds an item to shopping list, any other member can use a phone to see this list while in the store. No need to call or text your household members for this purpose anymore. To see details and create a free account, just go to Grocify website. This entry was posted in General on January 30, 2013 by vradmilovic. We are happy to inform you that new major update of CD Label Designer, our popular CD/DVD label and cover maker software, is out. We hope that you’ll find that these additions will make your designing experience even more enjoyable and labels even more eye-catching than before. This is a major update, so all current customers can buy an upgrade for 50% of the full price, and customers who bought after Aug 1st, 2012 can get it for free. To take an advantage of this offer, just type your original registration key into Promotional code field in the order form (see instructions here), or contact us if you have any problems. How to get CD Label Designer for free? If you purchased after Aug 1st 2012, you already qualify for free upgrade. If not, there are still other possibilities for discount up to 100%. This entry was posted in CD Label Designer, General on November 23, 2012 by vradmilovic. Another Web Log Storming update is ready. This new feature you can use to rename accessed files however you wish them to appear in reports. One of uses involve grouping files. In this image, you can see examples of grouping all *.gif images into single fictional /not_important file and all /image/* files into /any_image file. From now on, in Hits report you can see which method web client used to access a file (GET, POST, HEAD, etc). Additionally, we added Method parameter under File parameters pane, so you can quickly check for any of methods. This is particularly useful for detecting hacker activity – you can now easily notice any suspicious POST access, which hackers often use when they are trying to upload malicious code to your website. This update is free to anyone who bought a license or update subscription within last two years (after Sep 3rd, 2010). Our standard policy is to give free updates for one year, but Web Log Storming wasn’t updated a lot during this year, so we felt it would be unfair for our users and decided to make an exception this time. Web Log Storming is an interactive, desktop-based web log analyzer for Windows. A whole new concept of website statistics makes it clearly different from any other web log analytics software. Browse through stats to drill down into details – down to an individual visitor’s session. Check the pattern of individual visitor behavior and how it fits into your goals. This entry was posted in General on September 3, 2012 by vradmilovic. © 2001-2019 by Dataland Software. All rights reserved.